YouTube is the second largest search network after its parent company, Google. As an artist, it’s more valuable now than ever to have a presence on YouTube and showcase your music. Earlier on the Stem blog, we talked about the importance of Search Engine Optimization (SEO) in our four step guide to help you grow your brand as an artist. 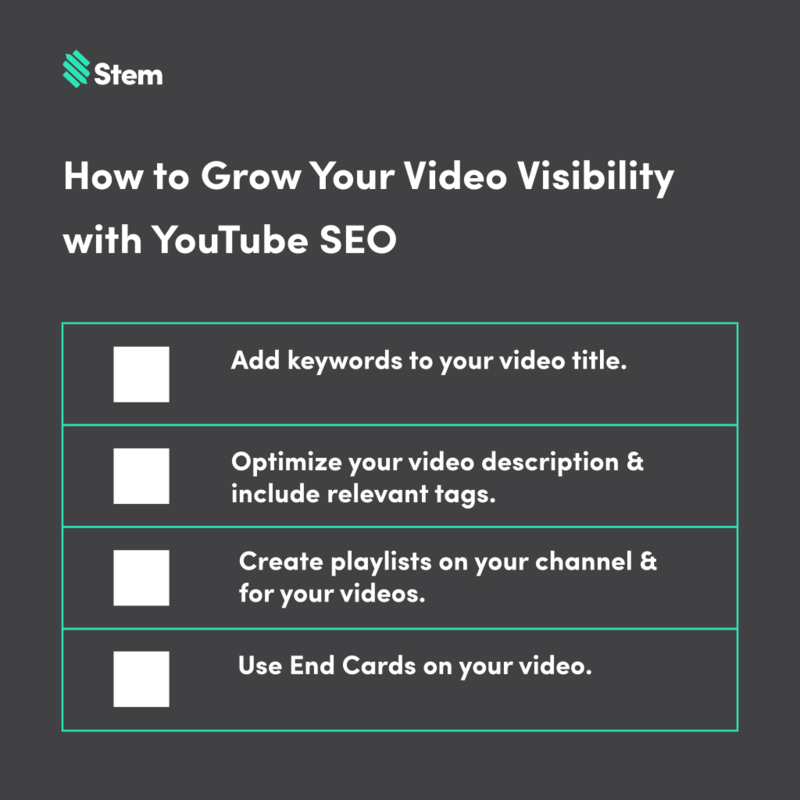 In this post, we’ll guide you through the process of increasing your video’s visibility through YouTube SEO. While additional YouTube promotion and marketing is beneficial, YouTube SEO is an important effort to put into place. With YouTube, it’s important to keep people engaged and in your channel for as long as possible. As an artist this helps you grow your fanbase and continue to reach current fans with new music and performances. YouTube is also a platform where the fans can feel as though they are a part of your journey, growing with and learning about you as an artist through behind-the-scenes looks, Ask-Me-Anythings and even song previews or lyric videos. As an artist, make sure you’re able to reach your fans when they’re searching for you on YouTube. It’s imperative to be as accessible as possible, to help your fans find your music and to continue growing your community. Below are some areas to focus on when you’re uploading new videos to YouTube (or editing currently live ones). These tips will help you show higher and more frequently when a fan searches for your name and your music. Video titles are crucial; they’re the first thing people read when skimming through a YouTube search. Make sure to include keywords in the title of your video. As an artist, some valuable keywords would be your band or artist name and the song title. Including these keywords in the title can help with people clicking to watch your videos, increasing overall video engagement. Include a link to buy or stream your album at the top of the description. Utilize important keywords throughout the description. 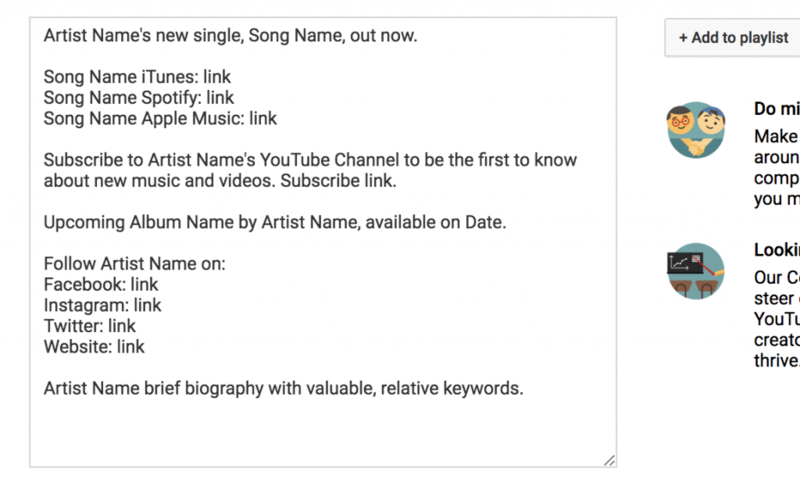 Adding relevant tags to your band or artist name, music genre and album titles can also help with showing up higher in the search. These aid your video ranking when people search for keywords that relate to these tags. Only include videos from your own channel. Each video should be in at least one playlist. You can include videos in more than one playlist that you create. Always link to a YouTube playlist that is relevant to that video so you can encourage fans to continue engaging with content on your channel. Include a subscribe option so your fans can subscribe to your channel and be notified whenever you upload a new video. Include a purchase or stream link for your music. Before you can include a link in your End Card, you need to associate your website with your YouTube account. You can learn how to do that here. If you gain a subscriber after that person watches 1 of your videos, the video that was watched will rank better. Subscribers matter more – likes/dislikes don’t have much of an impact. Comments can impact your ranking. They are another form of fan engagement and YouTube favors more direct engagement. Ensuring that your fans can find your music is key to growing your fanbase, and optimizing your content for search engines can help you make your music more accessible. In this case, SEO can help with your video’s visibility as your fans are searching and lead to overall YouTube video growth. 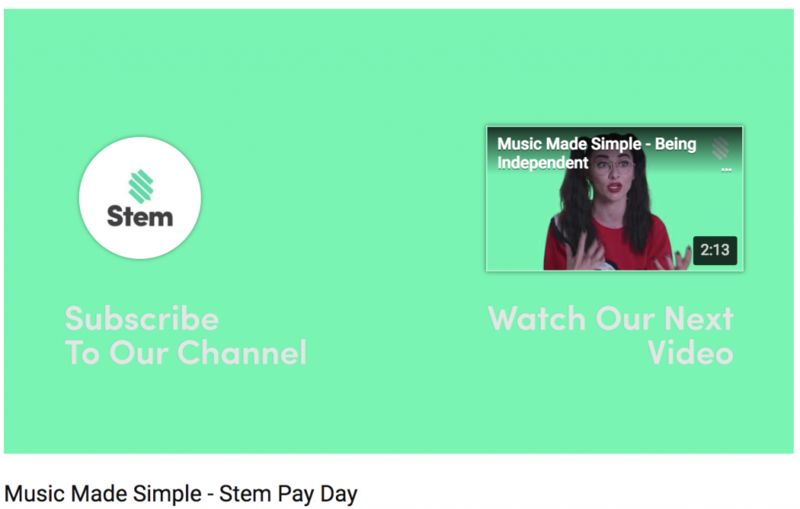 For more ways to market your music and reach your fans, check out the Stem blog.